Any regular road rider will be familiar with the rash of ‘cyclists stay back’ warning stickers on the rear of vans, buses and lorries. The road safety sentiment behind them may be sound, but the bright yellow signs look demandingly aggressive and avoid addressing some of the real issues of sharing the road. 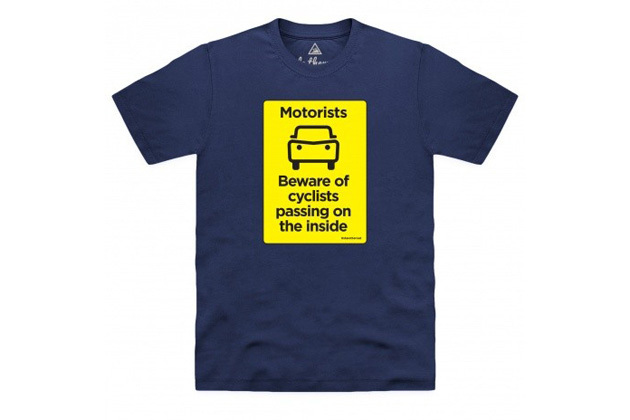 A new series of T-shirts designed by 100 Cycling Climbs author Simon Warren takes a tongue-in-cheek sideswipe at those back-of-vehicle warning notices, with designs including ‘motorists stay back’ and ‘motorists beware of cyclists passing on the inside’. The shirts are part of a large range of clothing aimed at cyclists designed by Warren, all now available online via retailer Shot Dead in the Head starting at £18.99. Many of the designs are also available as mugs, sweatshirts and hoodies, with some children’s sizes available.